We've seen the impact that AMD Ryzen CPUs have had in the short time they have been available. Earlier this month we saw that AMD CPU sales had started to outpace Intel CPU sales at a popular German etailer. Furthermore, many credit AMD's aggressive strategy with waking up Intel and forcing 'Chipzilla' to hasten its CPU and platform updates. Sadly for AMD, Vega might not have made much of a sales impact, with shortages forecast until next month. The next major product launch for AMD will be its new generation APUs, codenamed Raven Ridge. These SoCs combine Ryzen CPUs and Vega GPUs and are targeted at systems makers and PC enthusiasts who want to buy keenly priced processors with a good balance of CPU and GPU performance out of the box. APUs can facilitate capable compact PC and laptop builds and AMD's move to next gen CPU and GPU should make them all the better. 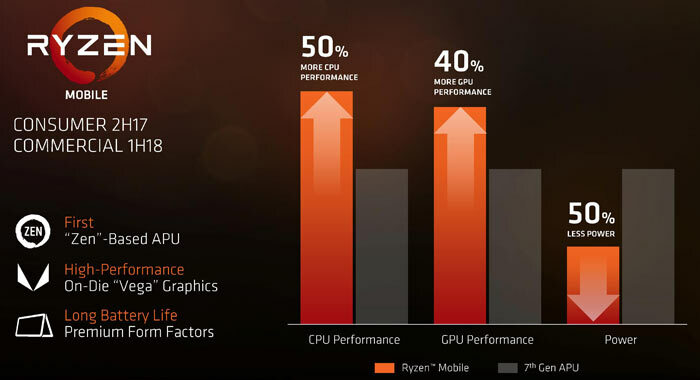 As you can see in the chart above AMD's first Ryzen/Vega APUs (for laptops) are claimed to offer 50 per cent more CPU performance and 40 per cent improved GPU performance while using half the power of 7th gen APUs. But will the charted claims tally closely with reality? At the weekend some Geekbench scores emerged to give us a taste of Raven Ridge performance. In the results you can see that the 'Ryzen 5 2500U' APU achieved a single core score of 3,561 and a multi-core score of 9,421. Let's compare that to a desktop 7th gen AMD A12-9800, which scores 2,608 and 6,388 respectively, running at 3.8GHz, and with a TDP of 65W. 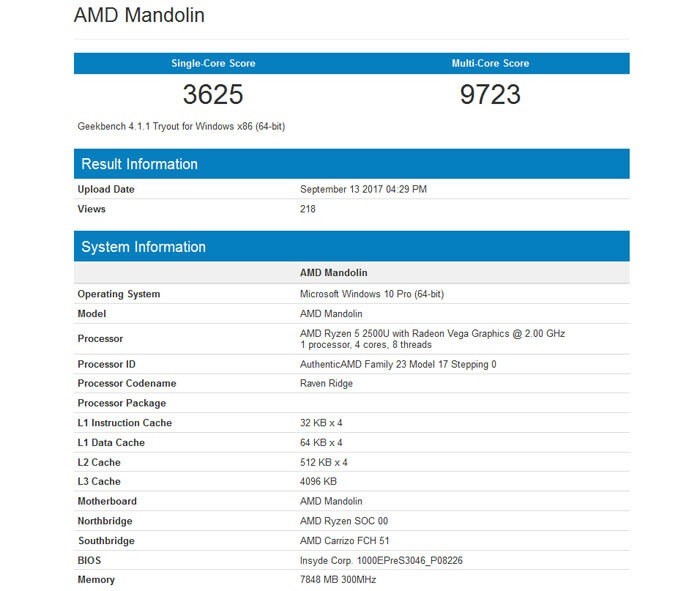 The Ryzen 5 2500U runs at 2GHz according to Geekbench but this is likely to be a base clock speed. Unfortunately this benchmark doesn't do anything with the GPU to provide an indication of the performance or makeup (how many SPs, how much graphics memory etc). With these leaks arriving the launch of Raven Ridge must be getting closer. It's a shame there isn't any hint at iGPU performance as that's where AMD could really take a lead over what i consider a weakness of Intel's. Iris Pro adds a huge cost to the processor, and AMD don't have the reputation/market share to launch products at that much of a premium. I'm guessing these are the CPU cores that will go into Playstation 5 but paired with a much more powerful GPU component in 2-3yrs time. 6/12 or 8/16 Ryzen CPU parts would finally break the terrible CPU bottlenecks that have plagued the PS4 & Xbox One this generation. Has there been any word on whether you can hybrid crossfire one of these APU's with a full/mobile dedicated Vega card? It's not something I would look at personally for various reasons, but the tech in itself and possible applications does interest me.